Ronteweiénstha Tehontatia'takéhnhen, a Mohawk phrase for students helping students, perfectly describes the day a group of high school students had on McGill campus on March 19. As part of a growing mentorship program, McGill student mentors, who have been working with students from Kahnawake for the past semester, invited their mentees from the Kahnawake Survival School onto campus for the day. Ronteweiénstha Tehontatia’takéhnhen, a Mohawk phrase for students helping students, perfectly describes the day a group of high school students had on McGill campus on March 19. As part of a growing mentorship program developed by the Social Equity and Diversity Education (SEDE) Office, McGill student mentors, who have been working with students from Kahnawake for the past semester, invited their mentees from the Kahnawake Survival School (KSS) onto campus for the day. For the morning, students accompanied their mentors for one-on-one activities. 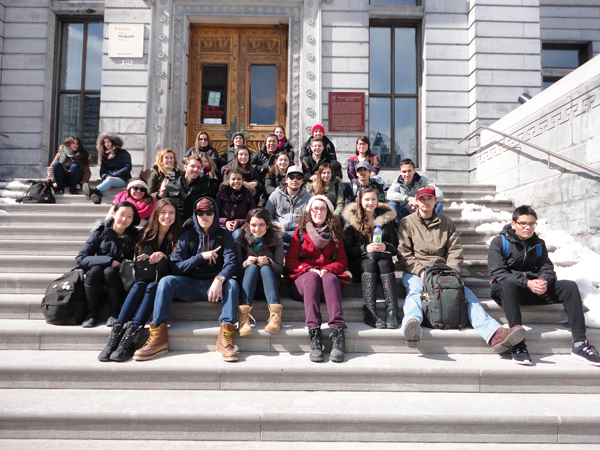 Some students had breakfast at Bishop Mountain Hall, toured the Athletics Facilities, and got a general feel for the extra-curricular life as a McGill student. Others took the opportunity to sit-in on class with their mentors, seeing what McGill has to offer inside the classroom. The group then congregated for lunch and presentations by the First People’s House about the services available on campus for students, followed by a scavenger hunt at the Redpath Museum. 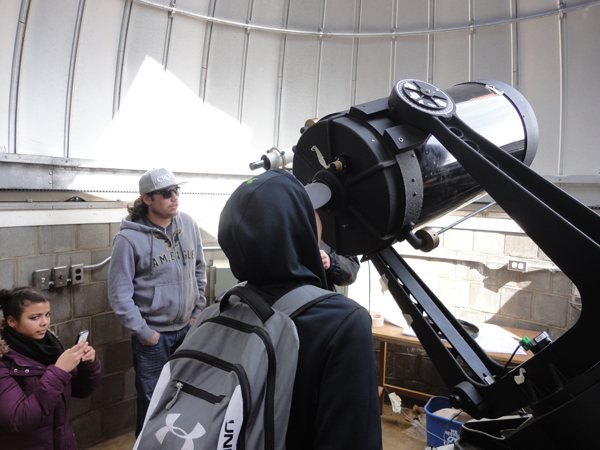 Through these various activities, students from KSS got a chance to experience life as a McGill student, encouraging them to see post-secondary education as a viable option for their futures. “Programs like this mentorship project are vital for building bridges between Indigenous communities and McGill,” says Allan Vicaire, SEDE’s Indigenous Education Advisor. Vicaire, who co-organized the event alongside four McGill undergraduate and graduate students, Leslie Ann St. Amour, Ryan Caldwell, Graeme Reed and Kai Homer, stressed that this project is unique in its focus on the student experience. Vicaire also underscored the importance of not only bringing students from underrepresented communities at McGill onto campus, but also of making meaningful connections with these communities. This on-campus visit is the third of four events designed to strengthen the links between McGill students and students from Kahnawake. In the coming weeks, McGill mentors will return to Kahnawake to further solidify the relationships cultivated with this community over the past months. Returning again to Ronteweiénstha Tehontatia’takéhnhen, students helping students, these relationships are meant to help mentors as well as mentees. St-Amour’s experience speaks well to the group, as both mentors and mentees continue to speak highly of the event and the project as a whole. “I see this program developing to include students from other Indigenous community schools,” says St-Amour, as she recognizes the valuable ways this project promotes access to education for Indigenous communities. Last Thursday may have only been one day, but the relationships developing between mentor and mentee extend much further, helping strengthen the connection between the McGill community and Indigenous communities and students. A promising initiative. In my opinion though, it is crucial to include the opinion of participating Kahnawake students. How did they feel about their experience?